If you don't host your blog with HubSpot, you can still offer an email-based subscription (RSS) to your blog using HubSpot. Click the Subscription Types tab. In the dialog box, add a name and description for your new subscription type, then click Save. If you have General Data Protection Regulation (GDPR) functionality enabled in your account, add a process and operation for your subscription type. Next, create a custom contact property for your external blog. This will be used in your subscription form, and to manage which of your contacts receive these blog subscription emails. Click the Field type dropdown menu and select Single checkbox. Then, click Create. Next, create a subscription form for these emails that you can embed on your external blog pages so that visitors can easily subscribe. Under Add form field, use the search bar to find the property you just created, and click the property to add it to your form. You can embed this form on your external blog pages. In the upper left, click the pencil edit icon and enter a name for the list, then click the dropdown menu and select Active list. Set your list filters to Contact property | select the property you created | is equal to | Yes. If you already have an existing list of contacts subscribed to your blog emails, you can import the list from a spreadsheet. 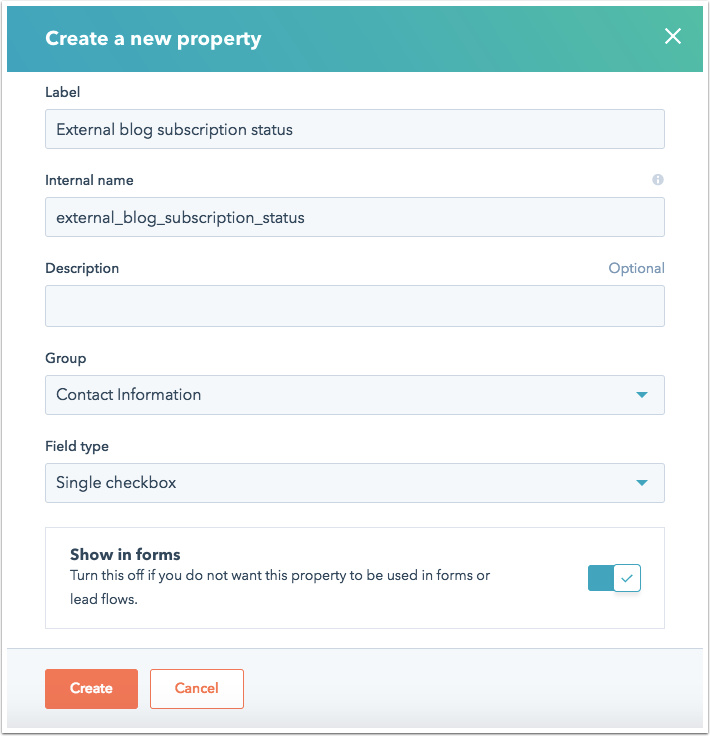 Be sure to include a column for Email with your contacts' email addresses and a column with a header that matches the property label for your subscription status property. Enter Yes as the value for all rows in the subscription status property column. Next, create the RSS email that will go out to your blog subscribers. The RSS email is simply an email template that you can customize to include the latest items from a particular feed, such as the RSS feed from your blog. You can use any email template that you like for this email, as long as it contains a main email body module. In the dialog box, select Classic editor. Select a template for the RSS email. In the dialog box, give your RSS email a name and select the Create as an RSS email checkbox. In the email editor, click the Edit modules icon in the left sidebar, then select Main Email Body. In the RSS feed URL text field, enter an RSS feed URL to see a sample preview of the feed. You can also set the number of posts to feature in each RSS email, and customize the styling of your feed within the Item layout/style text box. You can move around the tokens in your RSS email or adjust the fonts and font sizes. Click Advanced options to customize your author by line or set a max width for your post images. Please note: each send will only include new posts since the prior send of the email, up to the maximum number you've chosen. For example, if you've set a maximum of five posts to display in your RSS email and the next week you only publish three blog posts, the next send of your email will only include those three new posts and will not pull in two posts from the previous week. Make any additional edits to the email as needed and add your from details. Click the Subscription type dropdown menu to select the subscription type you created. Make any other settings changes (web version, campaign, etc.) as needed. Click the Recipients tab and select the list you created. 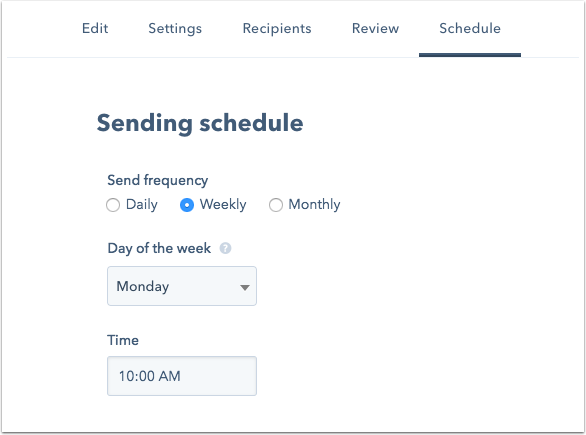 Click the Schedule tab and select your send frequency and the time of day to send the RSS email. If you select Weekly or Monthly, you'll also be asked to select a day of the week or month. In the upper right, click Publish. Your RSS email will be sent to your subscribers every day, week, or month that a new entry has been added since the previous send.